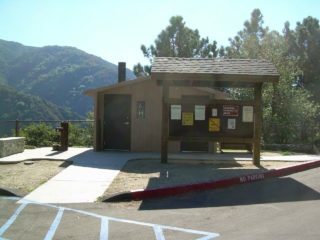 The trailhead to Sturtevant Falls is at the white pipe gate just as you enter the Chantry parking lot. Follow the asphalt road 3/4 mile to the bottom. Here, where Winter Creek meets the main creek, is the site of Roberts’ Camp and still so called. Ford the water or cross the green footbridge (relocated from First Water Camp) and continue on the broad center trail. Do not turn left at Fern Lodge Junction. The next stream ford has been known as Fiddler’s Crossing since 1979. If you’re lucky you’ll find out why. Just past Fiddler’s Crossing you may notice a clearing near cabin 87. This was the site of the Sierra Club’s Muir Lodge, which was washed away in the 1938 flood. The last bit of trail, past the outhouse, is a boulder-hop to the falls. Many people have been injured attempting to climb to the top. To see the pools above, backtrack and use the Upper Falls Trail.